The Workers' Compensation Notice for the State of Utah is a workers compensation law poster by the Utah Labor Commission. This is a mandatory posting for all employers in Utah, and businesses who fail to comply may be subject to fines or sanctions. This poster must be posted in a conspicuous place by all employers so that all employees can see it. 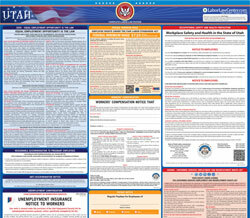 This poster describes how an employee can qualify for workers' compensation if injured when at work, how to report an accident at work, how to get workers' compensation, and what happens to those who commit fraud. It appears you don't have a PDF plugin for this browser. Please see the link below to download utah-poster-english.pdf. time lost from work, permanent loss of body functio n, prosthetic devices, and burial and dependent benefits in case of death. reported within 180 days of the injury or work-rela ted illness. Commission within seven (7) days of your doctor vis it. company will report the injury to the Labor Commiss ion. compensation benefits for the company. company and give you the claim number. and may ask you to fill out a request for compensat ion. Cooperate with the adjuster’s investigation of the  injury. company, including the work status statement. place of business of the employer as per §34A-2-204  and §34A-2-104.5, Utah Code Annotated.